Scammers are abusing the QZ8501 incident via the Facebook social media network. 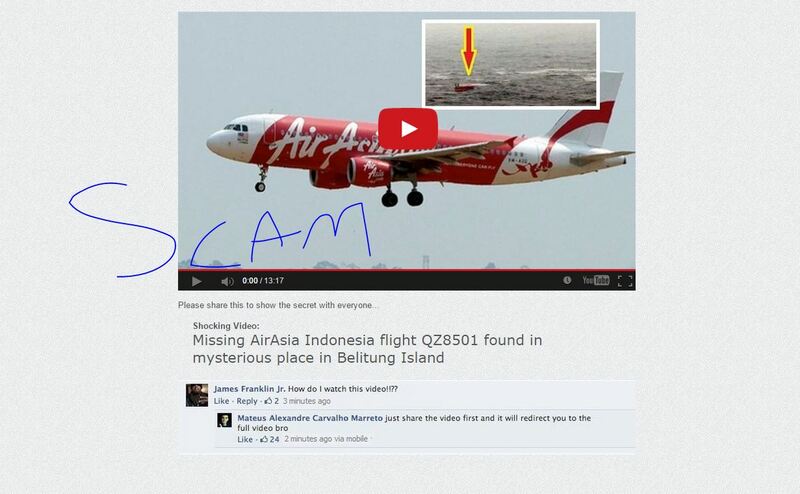 The scammers are claiming that they own footage which shows the official crash of the AirAsia QZ8501 flight. The scam is titled “Missing AirAsia Indonesia Flight QZ8501 found in mysterious place in Belitung Island” and it is currently being shared by unaware Facebook users. The scammers are forcing the victims to visit the malicious socialposthub.com domain which is currently hosting the “Missing AirAsia Indonesia Flight QZ8501 found in myserious place in Belitung Island” Facebook scam video. It is not the first time that scammers have been abusing incidents which have been shown in the news. The scammers have used these type of methods on the MH370 and MH17 incidents, during these events the scammers were able to infect thousands of users with unwanted actions or codes. The AirAsia QZ8501 scammers are claiming (and are going to continue to claim) that they own exclusive footage of the QZ8501 incident. They will also claim that they will have audio recording, pictures and even passenger video footages of the QZ8501. The scammers which are behind these type of scams have ZERO respect for their environment and they are only after money and data which they can use for their personal gain.